By the Southwestern United States, I designate here two large geographical areas: (a) the triangular portion of Southern California roughly joining Los Angeles, San Bernardino, and San Diego; and (b) the subset of the interior Southwest roughly comprising Las Vegas (NV), the Phoenix-Tucson “Sun Corridor” (AZ), and Santa Fe (NM). Urban growth and water consumption are two of the, and probably even the two, most problematic siblings framing the issue of sustainability—of its possibility or its impossibility—in the semi-arid Southwest. Does it make sense for a Swiss-based academic to look at a landscape so far from home? Well, for one, that’s part of what some of us do. We roam the Earth in search of knowledge, insight, and perhaps wisdom. We observe and we compare. Furthermore, the American Southwest is not only personally fascinating to me, but also universally relevant. In fact, there seems to be something very “holographic” playing out in that semi-arid part of the North American continent. The American Southwest is, and has been, the theater of three major developments that encapsulate much of today’s global predicament: (1) the drama of unsustainable human settlement, posing in particularly stark terms the question of how decentralized individual choices, coupled with rampant economic interests that shape “framework” conditions, can ever enter into line with carrying capacity, regeneration, etc. ; (2) the tragedy of the scorn and neglect of indigenous life- and thoughtways and of the sheer destruction of ancestral cultures in the name of “modernization” and “progress,” when such cultures had been capable of living sustainably on the same land for centuries, if not millennia; and (3) the hopefulness of new, emerging sustainable ways of life, as witnessed by a host of “alternative” and “countercultural” communities and movements that have sprung up in the Southwest since the 1960s—themselves split internally between a techno-optimistic strand (as represented by the northern New Mexico hippie commune that, under the leadership of John Allen, ended up building Biosphere II in southern Arizona in the late 1980s) and a low-tech, more radical strand (as represented in Taos, NM by Michael Reynolds and his “Earthship Biotecture” community – true, unsung American heroes active all over the planet these days). In a sense, my project overall can be located within Development Studies—with the significant twist that I am looking at overdevelopment rather than “underdevelopment,” as development scholars usually see it to be their mission. I am convinced that overdevelopment analysis is becoming increasingly crucial even for more traditional “development” studies, because the latter have been caught in the rat race of thinking up ways for “less developed” populations to become “more developed”—without much critical thought to what this entails, both for the planet and for the populations involved. The distorting forces of overdevelopment need to be studied and understood in detail so that they don’t end up corrupting “development” studies. In his book A Great Aridness: Climate Change and the Future of the American Southwest (Oxford University Press, 2011), William DeBuys argues that the conditions of drought and water scarcity that are beginning to befall the Southwest are going to reflect what will soon be happening in many other parts of the globe. Therefore, studying the Southwest and its contemporary challenges amounts to looking at a “living laboratory” in the present for the near future – for the American Southwest itself as well as for the whole “developing world” that desperately seeks to become overdeveloped. In his book Anasazi America (University of New Mexico Press, 2000, new edition 2014), David E. Stuart argues that the processes of collapse of the metabolically powerful ancient Puebloan civilization(s) of the Southwest between the eleventh and the thirteenth centuries BC, as well as the processes of adaptation of some of these cultures towards less complex but more metabolically efficient Pueblo settlements (some of which still exist today), have some significant lessons to convey for the present – for the American Southwest itself as well as for the whole overdeveloped Western world. Permacircularity occupies a key role in this project. There is a clear connection between the questions asked by DeBuys and Stuart in their books and the notion, which I’ve been defending in this blog, that growth and development can only make sense within a circular metabolism – or system of linked metabolisms – that operates under clear resource limits and ecosystem boundaries. This allows for fascinating questions, such as this one (related to water issues, which need to be addressed with particular intensity): What is it that makes the ancient Hohokam irrigation ditches on the Gila River or an acequia canal in northern New Mexico (as well as, for that matter, a bisse in the Alps of the Swiss Valais) representative of a sustainable human inhabitation while the Central Arizona Project aqueduct – also, after all, a canal but just much bigger one – that diverts water from the Colorado River towards Phoenix and Tucson epitomizes unsustainability? Why is very small-scale and local streamwater diversion more indicative of permacircularity than vast-scale diversion across county and even state lines? 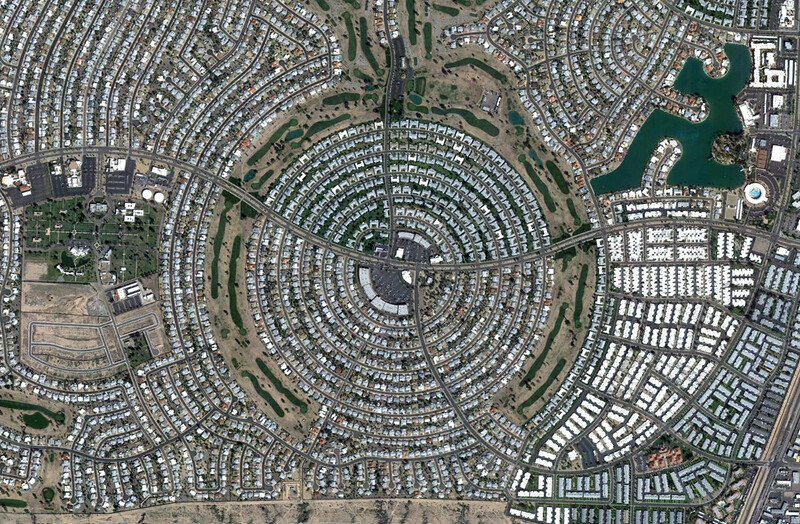 What’s the difference in terms of permacircularity between a relatively frugal and efficient 13th-century farming civilization (the ancient Hohokam) and a sprawling 21st-century metropolis (today’s Phoenix-Tucson agglomeration linked by the “Sun Corridor”) occupying roughly the same area? 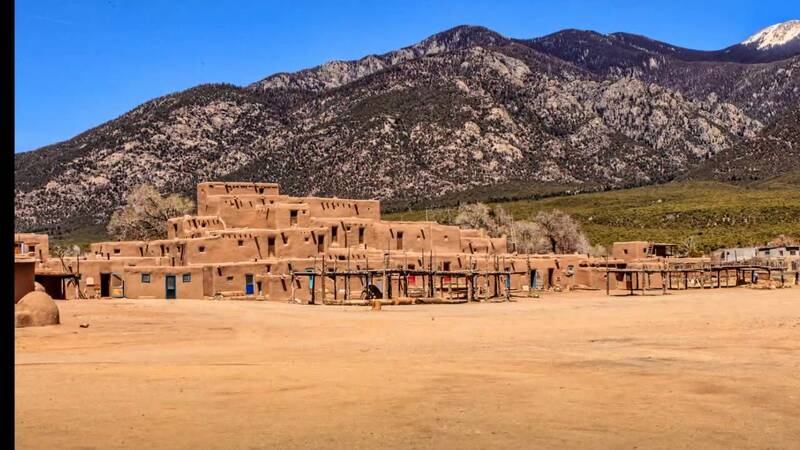 And how do we react when we learn that even the comparatively much more permacircular Hohokam collapsed due to human overextension coupled with climate instability – and when we realize that for all their technological prowess, demographic growth, and economic strength, and maybe because of them, today’s Southwestern megacities are so much less resilient (and therefore sustainable) than were those ancient settlements? 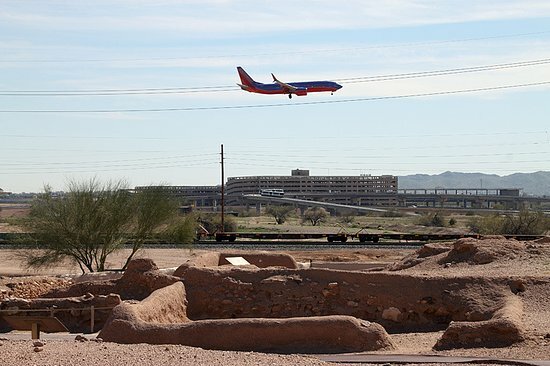 Hohokam ruins between Phoenix and Tucson, AZ – an ominous reminder? What cultural lessons do inhabitants of the contemporary Southwest – whom I envy on many grounds, not the least of which are the stunning arid landscapes they’re allowed to wake up in each morning and the amazingly blue sky they live under almost every day – need to draw from the ancient Puebloans, whose Pueblo descendants still live all over the area? Are there certain forms of “water wisdom” and of “desert wisdom,” certain forms of “indigenous ecological knowledge,” that were taught and transmitted in those traditions and that could, if adequately revived and perhaps partly reformulated, benefit all Southwesterners – Native and non-Native alike – and, further, all human beings in this day and age of global warming and resource depletion? How can the economy of the semi-arid Southwest become permacircular once more, or at the very least start taking that direction within the coming decade? Much more is at stake here than nostalgia or regionalism – as DeBuys has clearly indicated, the sustainability challenges faced by the Southwest may be particularly graphic and spectacular given its geography and its climatology, but they will be the challenges faced by many other communities the planet over – even perhaps in unsuspecting areas that, while different, will need to face up to warming and more frequent drought, such as Rhone Valley in the Valaisan Alps in southwestern Switzerland, not far from where I live and work. These, and many others, are questions I have become engrossed with as I have traveled the American Southwest, fallen deeply in love with it, and read more and more literature about it – although not as quickly as the alarming rate at which newly arrived books keep piling up everywhere in our apartment and in my office. If you’ve read and enjoyed my earlier four-part series “Further Glimpses of Permacircular America,” you’ll see why I believe these questions are crucial. From the Swiss Southwest to the American Southwest, from the Lower Valaisan village of Grimentz (in the Val d’Anniviers) to the New Mexican pueblo of Taos (at the foot of the Sangre de Cristo Mountains), there are worlds of difference but also – I believe – a mysterious thread of the heart and of the intellect: a relentless quest for respectful human inhabitation that lets mountain streams sing and people seek existential meaning in resonance with the biosphere. The beauty of the natural setting as well as the challenges of keeping the built environment aesthetically pleasing (with a mixture of traditional and modern styles) pose similar challenges, albeit in wildly differing cultural and historical, as well as ecosystemic, contexts. Water issues also differ in a large number of ways, but hydrological problems due to damming and climate change are analogous in the two areas. The issue of how to tease out and address the ecological identities of children and adults in the two cultural contexts, in order to generate a contextually adapted indigenous ecological education in each case, is foremost in a number of indigenous educators’ minds in the American Southwest – and could and should become foremost (once more) in the Swiss Southwest. There is much to be learned by a comparative perspective that keeps a respectful distance between the two contexts while, at the same time, attempting to build bridges of shared wisdom and common purpose. My own intellectual leanings, as well as the lessons I draw from the Native American authors with whom I’ve had the pleasure to interact – such as Gregory Cajete from the University of New Mexico – lead me to adopt key ideas from existential anthropology (see, e.g., the work of Harvard professor Michael D. Jackson): Humans are heavily determined by social and historical givens, by class, gender, etc., but at the same time, the way they respond to the world around them — in particular to what they see changing in the ecosystems that support them — isn’t just mechanical; wisdom as well as ritual and myth have their roots in personal quests for meaning, beauty, reassurance, and stability just as much as in traditions and customs; in fact, the latter might well be ways to ensure the intra- and intergenerational transmission of the former – propositions of meaning more than of belief. (The trouble being that rigid belief has often been a convenient and expedient way to generate meaning, unquestionable but reassuring.) When we ask ourselves how inhabitants of the Swiss Southwest and the American Southwest can cross-educate each other and cross-pollinate their respective cultures, how they can help each other understand the challenges of water, drought, or urban growth, it’s not just a matter of analyzing laws or rules – some deeper meaning-structures (what a stream means, how drought generates anxiety, when myths help to express traditional knowledge or wisdom) need to be examined as well. It’s an exhilarating prospect to work towards. Looking forward to collaborations! Excellent point about “development studies”!